At TheCreditReview, we value your trust. TheCreditReview.com is a free online resource that provides valuable content and comparison features to visitors. To keep our resources 100% free for consumers, TheCreditReview.com attempts to partner with some of the companies listed on this page, and may receive marketing compensation in exchange for clicks and calls from our site. Such compensation can impact the location and order in which such companies appear on this page. All such location, order and company ratings are subject to change based on editorial decisions. TheCreditReview.com does not include all credit repair and reporting solutions available to customers in the market. As their name implies, Accredited Debt Relief is a A+ BBB accredited service that helps settle secured and unsecured debt. They also offer other services besides debt settlement, including credit counseling, debt consolidation, and debt management. Since 2008, Accredited Debt Relief's professional debt consultants have assisted their clients in settling both secured and unsecured debts, which includes credit card and medical care debt. Accredited Debt Relief is A+ accredited by the Better Business Bureau (the highest ranking possible), and their service providers have a combined 20+ years of experience in the debt relief industry. Choosing Accredited Debt Relief as your debt settlement solution can prevent you from having a bankruptcy listed on your credit report (which would last for 7-10 years) and help you keep your car, home, and other important possessions. Accredited Debt Relief is powered by Beyond Finance, an industry leading debt resolution company that leverages advanced technology and innovative debt reduction programs to help clients resolve their debt in 12 - 48 months. Accredited Debt Relief can assist with helping reduce pesky collection calls as well as setting up a central settlement account to help with debt negotiations. 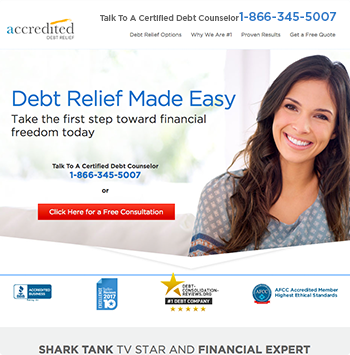 Top industry accreditations: Accredited Debt Relief is accredited by the AFCC (American Fair Credit Council), IAPDA (International Association of Professional Debt Arbitrators), and San Diego Regional Chamber of Commerce. Very positive customer reviews: Accredited Debt Relief currently has over 1000 Great and Excellent rated reviews on Trustpilot (an independent review site), which is 97%+ of their total user reviews. High transparency: The website includes detailed information on FTC guidelines for debt settlement companies. Reasonable fees that are also industry standard: Fees are around 15 - 25%. Depending on the state, they charge 4 - 8% annually of the total debt enrolled and spread out the fees over the course of the program. No risk guarantee: This ensures you do not pay until the debts have been settled. 100% free initial no-obligation consultation: Simply fill out a form on their website to find how out much you could reduce your credit card debts. Personalized experience: Clients are provided with one representative through the debt settlement process. Works with largest industry leaders: Accredited Debt Relief has successfully negotiated with these credit card companies: Bank of America, Wells Fargo, Chase, CapitalOne, Citibank, American Express, Sears, USAA, The Home Depot, US Bank, HSBC, GE Capital, Barclays, and OneMain Financial. Positive customer service reviews: Past customers praised the representatives on their assistance. Many stated that they felt comfortable with the reps.
Track your progress: Their personalized online dashboard allows you to check personal progress in real time. They accept a minimum $7,500 of unsecured debt. This is significantly lower than the industry standard minimum, which is typically $15,000 for companies like Freedom Debt Relief. Experienced Providers: Accredited Debt Relief's partners have over 20 years of experience. Charitable causes: In addition to providing debt consolidation services, Accredited Debt Relief donates money to charities such as St. Jude Children's Research Hospital, the Wounded Warrior Project, the Salvation Army, Susan G. Komen for the Cure, and Father Joe’s Villages. Accredited Debt Relief only serves clients in 36 states. Debt settlement has a risk of negatively affecting credit, which can limit access to future loans and credit lines. When Accredited Debt Relief is negotiating a settlement, you must stop paying any outstanding balances. This can cause even more debt due to the added interest and fees, and even result in being sued or having overdue accounts to be sent to collections. Any forgiven debt is taxable income by the IRS, so you may end up owing more in taxes. However, you can apply for an exemption with Form 982. According to the company, the minimum debt required is $7,500 and the debt reduction fees range from 15 - 25% of enrolled debt (depending on the state). You can sign up online for free by filling out personal and financial information. You will then receive a quote from Accredited Debt Relief on the pricing and services. Once enrolled, you are advised to keep one low balance credit card in case of an emergency, but you will not have access to any other lines of credit. You make monthly payments into your savings account during negotiations and creditors are paid off with the lump sum from this account. If you make those monthly payments you pay around 50% of your total enrolled debt before fees, before then paying 68 - 75% over a course of 2 to 4 years. Accredited Debt Relief has a no risk guarantee, which is in compliance with FTC regulations that state they cannot charge fees until a settlement agreement is reached. Their teams have negotiated with credit card companies and financial institutions such as Bank of America, Chase, Capital One, and Wells Fargo. What is the minimum debt needed to enroll into Accredited Debt Relief's programs? The minimum unsecured debt needed is $7,500. What are the fees for debt reduction? Debt reduction fees range from 15% to 25%. How soon does Accredited Debt Relief start working with creditors? On average, 1 to 2 weeks after you’ve signed up for the program. The initial calls will let creditors know that you are entering into a partnership to reduce your debt and also let them know to call Accredited Debt Relief instead of you. The first settlement usually happens within the first 6 to 9 months of the program. It's also noted that fresh start clients typically see settlements happening faster because they aren’t paying fees until the settlement is negotiated. What happens if you miss a monthly payment? In the case you have a financial emergency and cannot make your monthly payment, you should contact Accredited Debt Relief about the situation at least 5 business days ahead of the payment due date. You will not be kicked out of the program, and Accredited Debt Relief will work with you to get you back on track. However, missing payments will delay your debt relief program and could affect possible settlements. What happens if my creditors try to sue me? In this case, Accredited Debt Relief might move this account to their priority list. It is also noted that in their experience many lawsuits are never actually filed - they are just wanting a settlement. However, if a lawsuit is filed against you, Accredited Debt Relief can attempt to resolve the account by setting up a specific payment plan. Why leave a review about the service here? Your reviews are a valuable source of insight for us to improve our service as well as improve the offerings. All pros and cons submitted here are evaluated and are responded. We also share these insights with our partners so that they could improve their offerings as well. © 2019 TheCreditReview.com. All Rights Reserved.